Throughout the world funeral flowers have played an important role in funeral customs because of their fragrant beauty and comforting qualities. What’s more, they serve as a herald of hope reminding us of the spirit of life. In ancient times, tradition called for loved ones to use flowers and herbs to anoint the bodies of the deceased, while aromatic flowers and plants were used to decorate the burial site. Today, flowers remain one of the most beautiful ways to express our condolences when words fail us. During times of sorrow, sympathy flowers are messengers of hope when it’s needed most. I just heard the news… Is it too late to send funeral flowers? No matter when you hear the sad news, sending flowers is always appropriate. 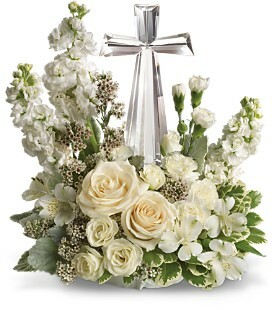 You can choose to send a flower arrangement to the service or home of the surviving family members. What if I don't know what to send to a funeral that is out-of-town? There are many types of services, from traditional funerals to memorial services. It is appropriate to buy and send a funeral flowers to any of these services. If you are sending flowers to a service that is out-of-town, ask that the local florist who delivers the order to fill it "according to local customs." Then they will send the style of design that is best suited for the service. We collected money among the people in our office to send flowers. How do we sign the card? You can sign it with the name of the business or group or use the individual names on the card. Try to keep the name list as concise as possible. You might want to get a larger greeting card and have everyone sign it as you collect the contributions. Then bring the card to the flower shop and they can attach it to the design you are sending. 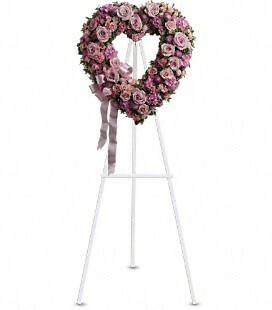 Are there certain types of sympathy flowers that are not appropriate for sending to a funeral? Every flower when tastefully arranged is appropriate for expressing sympathy. That being said, for designs that are going to a memorial or funeral service, larger flowers are usually used to create dramatic tributes. These might include gladioli, snapdragons, lilies, standard chrysanthemums, carnations and roses. Small-scale flowers in mid- to small-size designs are used for sending to the home. These may include carnations, roses, spray roses, alstroemeria, lilies, daisies, liatris, delphinium and stock. You may also want to browse Flower Color Meaning and Meaning of Flowers to impart special symbolism or intention to your gift. 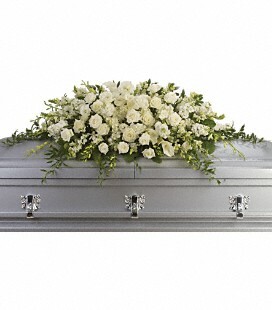 The obituary says "In lieu of funeral flowers," but I still would like to send flowers – is this appropriate? Yes, flowers are also appropriate in these situations. Many people choose to send a token of remembrance to the service or family home as well as a donation to the charity indicated. I am not certain where the service is being held. Can the florist help me? If you have the name of the deceased and the funeral home, most florists have the obituaries on hand to check them. You can trust the florist to get the sympathy flowers to the funeral on time. I am not sure how to sign the card. What should I say? Most enclosure cards are pre-printed with messages like "Deepest sympathy" or "With love and sympathy." All you need to do is sign your name. You should use your first and last name to avoid confusion for the family. If there are a group of names, you should spell each one for the person taking the order to make sure he or she has the correct information.